My friend Jimmy and I did our favorite bike ride this morning. We circled around Manhattan along the Hudson and East Rivers. It was a fantastic day for a bike ride. Since its been four months since we did that ride, we saw a few new things along the way. 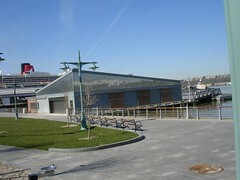 My favorite new thing I saw today was this Boathouse on the Hudson River around 57th Street. Charlie told me and Brad about this new boathouse early last week.